Are you interested in joining our Liv Novice Mountain Bike Rides for women, but not sure what to expect? Below is an overview of what we do on our intro to mountain biking group rides. These rides run for about two hours and are capped at eight people, so we can tailor the ride to suit all of the participants, so you must register in advance to reserve your spot. Meet-up and introductions are done before we even start to pedal. We’ll ask about your comfort level on the bike and past riding experiences so we can suit the ride to you. We’re not judging in any way, so please don’t feel pressure when answering honestly. While this discussion is happening, you will be fitted for your demo bike, and shown how to use all the features of the bike. If you are coming with your own bike, we will give it a quick bike check to make sure it is ready to ride. We will begin with a quick warm up climb, between 15- 20 minutes, to get to the trail head. Before starting down the trail, we will go over some basic body positioning followed by a couple of drills to help reinforce muscle memory. This portion will be take approximately 20 minutes. Once everyone has completed the drills, we will move onto the trail and apply our new skills! On the trail, will stop and go over key sections and discuss line selection, trail etiquette, technical trail features such as log, ladder bridges and roll overs. We will allow time to session these sections so that everyone has the opportunity gain confidence in these areas. Upon completion of the technical trail, we will end our ride with a faster, flow trail ending back at our starting point. All rides are guaranteed to end with everyone smiling and high five-ing! Visit our ride event page for more logistical details here. If you have any additional questions, please contact us at the store by email, phone, or in person. I hope to see you all on the trail soon! Dorothy is a ray of sunshine! She’s an amazing baker and super-generous with her time, often volunteering at trail days. 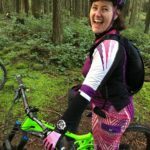 She LOVES riding bikes and sharing her passion for riding with others, which is why she’s the perfect person to lead our series of Novice Women’s MTB Rides.